Hours after blaming Russia-backed Ukrainian separatists for the shooting down of a Malaysian Airline plane that killed nearly 300 people, US President Barack Obama has called on his counterparts seeking an impartial international investigation. In separate phone calls with Obama British Prime Minister David Cameroon; German Chancellor Angela Merkel; and Australian Prime Minister Tony Abbott, agreed on a prompt, full, unimpeded and transparent international investigation, the White House said in a statement on Friday. “They (Obama and Merkel) reaffirmed that all parties must guarantee international investigators full, secure, and unfettered access to the incident site to conduct a thorough and credible investigation without delay. “They also noted the necessity of all evidence remaining intact and in Ukraine,” the White House said. 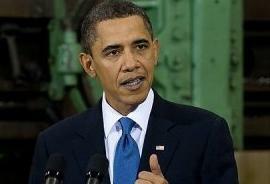 Obama and Merkel discussed the latest information regarding the tragic downing of Malaysian plane, the White House said. Discussing the plane shoot-down, the White House said, Obama and Cameron agreed that an independent, full, credible, and unimpeded international investigation must begin immediately. “They also agreed that all countries should do their utmost to ensure the Russian-supported separatists grant secure access to the site of the incident,” the statement said. “The two leaders discussed the recent steps taken by the United States and the European Union to increase the costs to Russia, given its failure to take the concrete steps needed to de-escalate the situation, and reiterated the need to take further action if Russia continues to fail to take these steps,” it said. According to the White House, Obama expressed condolences on behalf of the American people to the Australian families who lost loved ones on board the flight. “The two leaders discussed the importance of a prompt, full, unimpeded and transparent international investigation, and they stressed the need for immediate access by international investigators to the crash site,” it said. Obama underscored continuing US support and cooperation with Australia as this issue unfolds, and the two leaders committed to remaining in close touch moving forward, the White House said. Separately, US Vice President Joe Biden called Ukrainian President Petro Poroshenko; and the Polish Prime Minister Donald Tusk to discuss the issue. Biden and Tusk agreed that a prompt international investigation with safe and unimpeded access was the need of the hour. The leaders also discussed the situation in eastern Ukraine, noting that Russia was supplying weapons and training including anti-aircraft weapons to the separatists, with profoundly de-stabilising consequences.